Let me inform you through our Summary Newsletter of the selected activities and events that took place in 2018. At the same time we would like take this opportunity to thank all Healthy Cities and Regions and our partners for good cooperation in the past year. We hope that also in 2018 we will jointly devote our energy to activities related with sustainable development, health and quality of life promotion in our Cities and Regions. We know the winner of the BEST Practice Voting for 2018! The Healthy Town of Krizanky won the voting contest for the BEST Practice of Healthy Municipalities and Regions in Czechia selected from seventeen documented good practice examples of 2018. The voting contest for the “Healthy Cities Best Practice 2018” had been running for several months on the Healthy Cities facebook pages with nearly 16,000 followers. It was kicked off at the Autumn Healthy Cities School and closed early this year. 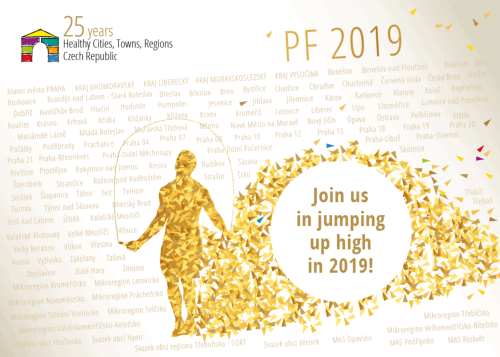 The results were announced and the awards were handed over on 24 January 2019 at the national Healthy Cities conference called ”Vyšvihněte se s námi!” (Make it to the top with us!). We would like to congratulate the Healthy Town of Krizanky and thank all the participants for promoting inspiring approaches to improving the places where we live! 3x accredited training courses on “Principles of sustainable development in connection with strategic planning and quality of life“. In 2018, as in the previous years, Czech Healthy Cities network provided its members with a wide range of services. In our publication “Member benefits” you will find an overview of what we offer and are able to implement in areas such as participation, sustainable development, projects, quality management and many other topics. We provide training and education as well as tailor-made consultations. We seek good practice examples and promote your inspirations. A number of activities can be freely used by towns and regions that are not our members yet. Our events are open to everybody, take inspiration from Healthy Cities and become one of them – as you will see, it is worth it! We have published 7 on-line Newsletters on our website reporting on the latest developments in a given month, including its translation into English. The Newsletters were sent to more than 2000 addresses in the Czech Republic and to nearly 300 addresses abroad. We seek and promote good practice examples – on our unique web signpost called SUSTAINABLE DEVELOPMENT GALLERY you will find over 315 thematically sorted good practice examples from 80 places in the Czech Republic as well as from abroad. Additionally, in 2018 we had 322 new short inspirations – small projects, inspirational event or activities. Loaded with news, our INSPIROMAT for towns and regions is sent to all interested parties 3 times per month. 15 531 people liked our Healthy Cities Facebook. Our portfolio of social networks is also formed by Instagram and Twitter. Both networks will enable people to follow us on smartphones, but they are also accessible via PC. Furthermore, we administer popular profiles of Czech Healthy Cities on Linked In as well as a video channel with up-to-date and interesting media coverage from various cities and towns. In 2018, our website ZdravaMesta.cz recorded 30 863 visits. 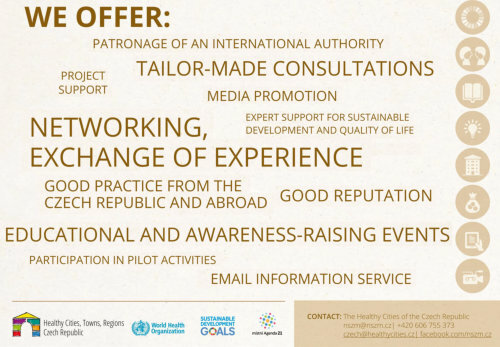 We run 11 thematic e-mail conferences for those interested in sustainable development, strategic management, health, volunteering and other topics. Healthy Cities, Towns and Regions hold regular meetings for their citizens to discuss the most burning issues concerning the place where they live. In 2018, the Healthy City Forum was held in 51 towns and cities with a total attendance of 3843 citizens. Another popular event are youth and school fora (32 events during the year 2108) where pupils and students discuss the development of their municipality. As in the case of the “adult fora”, the outcomes of these public meetings are submitted to a municipal or city council which will address them further. The purpose of these events is to enhance interest in public matters across all generations. Again in partnership with Palacky University Olomouc we have offered emotional maps to cities. Emotional maps build on the concept of GeoParticipation using geospatial tools to involve participants in decision-making. Cities and towns will receive their emotional maps in a regular office format or as a GIS layer. Healthy Cities are going to offer this service to its members for free also in 2019. Among other additional services that are free of charge for HCCZ members, we offer also follow up e-surveys in computers or mobile phones, that help to check the outcomes of the planned events at wider spectrum of respondents. In our perspective there is also a new tool for participatory budgets. HCCZ prepares these activities in cooperation with the Mobile broadcast. … watch our new short video, which in brief entries answers the questions: what is the first thing that crosses your mind when we say Healthy city, town, region? Which of the services of the association do you value the most? For how many years has been the city, town, region a member of the HCCZ association? What can you, as a Healthy city, town, region, be proud of? In what do you excel? … or just contact us: nszm@nszm.cz - any time and we will be glad to assist you. The Newsletter is published by Healthy Cities of the Czech Republic, contact: HCCZ Office. The photographs used come from the HCCZ and its members archives. This HCCZ Newsletter was sent to you due to previous cooperation, we are happy to share our news with you. In case you do not want to stay in touch anymore, you can withdraw your email address from the mailing list now or at any point. If you do not wish to receive any emails from us any more, please send us an email ‘STOP’ by replying to this message or to the address nszm@nszm.cz.